Not everyone in public loves being sniffed, barked at, or jumped on by a well-meaning dog. Plus, dogs can chose the worst moments to answer nature’s call or chase a squirrel. A dog that has been properly socialized and trained is happy, confident, and free. When a dog knows good habits and understands expectations, they don’t have to compete for negative attention, and are less of a danger to themselves and others. We are hosting Behavior Training Classes at Springbrook Animal Care Center. These 6-week classes can change a dog’s life by giving them the skills they need to succeed at pet events and other social gatherings. Please call us for more information. Always a good idea before heading into a public space, exercising your pet is extremely helpful. That way, they’re relaxed and open to the new experience because extra energy has been spent. Make sure your pet listens to and responds to basic commands like sit, stay, leave it, and come. This will help enormously if you see or anticipate your dog forgetting their manners in public, but obedience training can ensure the safety of others and their own. Pet events are typically full of other like minded owners and their adorable four-legged besties. We can make new friends and lavish attention on the pets that complete our lives. However, a few missteps can create awkward moments, and cause unnecessary stress or anxiety. Always ask permission for your pet to approach another owner’s pet. Not every dog is up for close inspection and evaluation from a stranger. Redirect your dog away from other pets that don’t seem interested or visibly appear threatened or upset. Bring snacks to help your pet stay focused and behaved. Reward them when they’re showing you their skills! These will be essential when posing for a photograph! If another animal approaches without warning, use a calm, reassuring voice and pull your pet away if you observe discomfort or stress. Panting, yawning, licking, pinned back ears, and pacing are all signs that your pet is ready for a break. Take your pet away from the action if they need to be calmed down. Only return when your pet demonstrates control. We hope that you and your pet will join us at Springbrook Animal Care Center on Saturday, April 13th from 11am-2pm for our Spring Adoption Event. 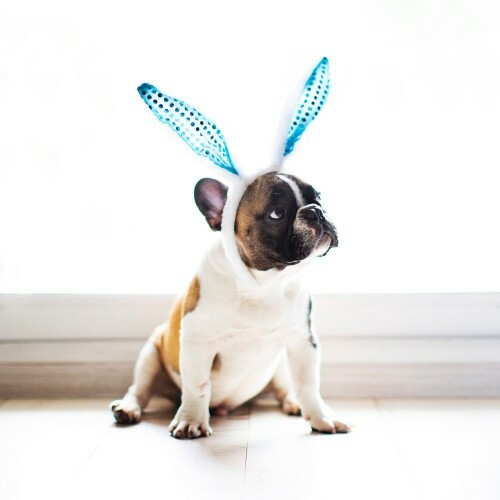 We’ll also be providing pet pictures with the Easter Bunny, and we’d love to see your pet! If you feel that your pet might not be up for the crowds, but you still really want an Easter Bunny picture, please contact us!